DECREASING SPEEDS LATE IN THE AFTERNOON. OF 75 MPH OR MORE CAN LEAD TO PROPERTY DAMAGE. 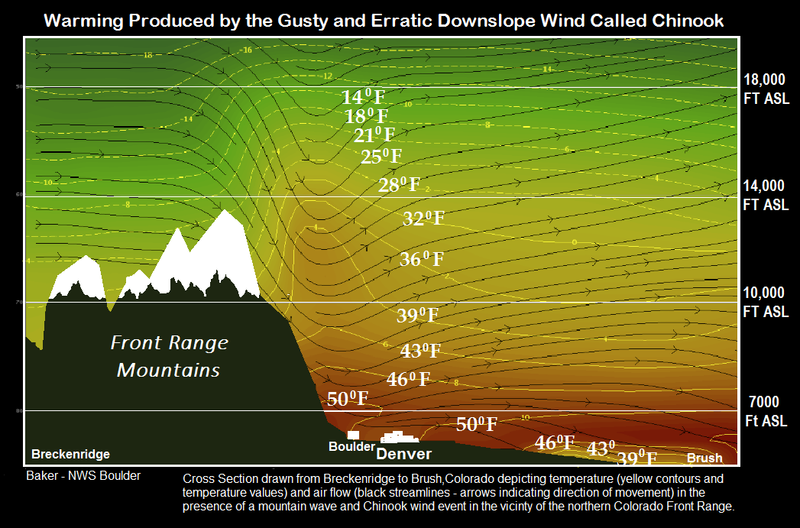 Today’s weather is the result of a strong Mountain Wave established over the front range of Colorado. 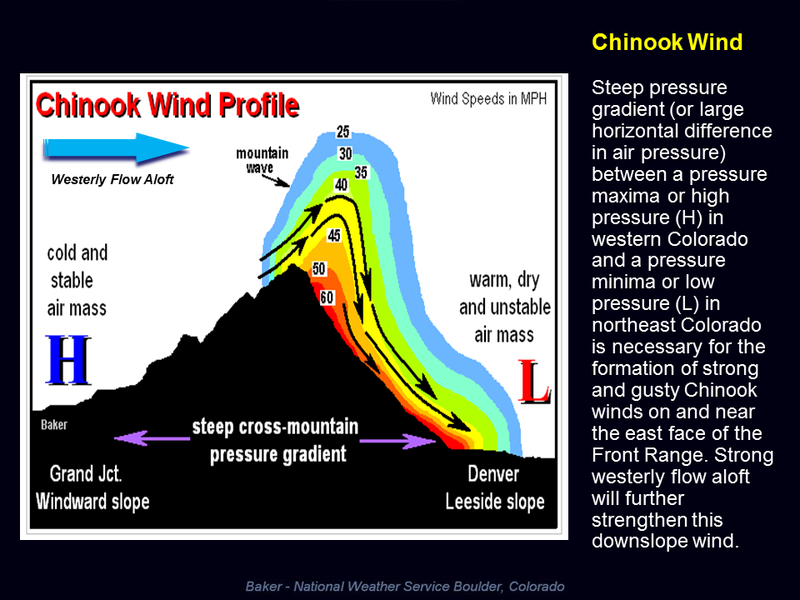 A strong storm system with westerly flow aloft creates as High Pressure West of the mountains. 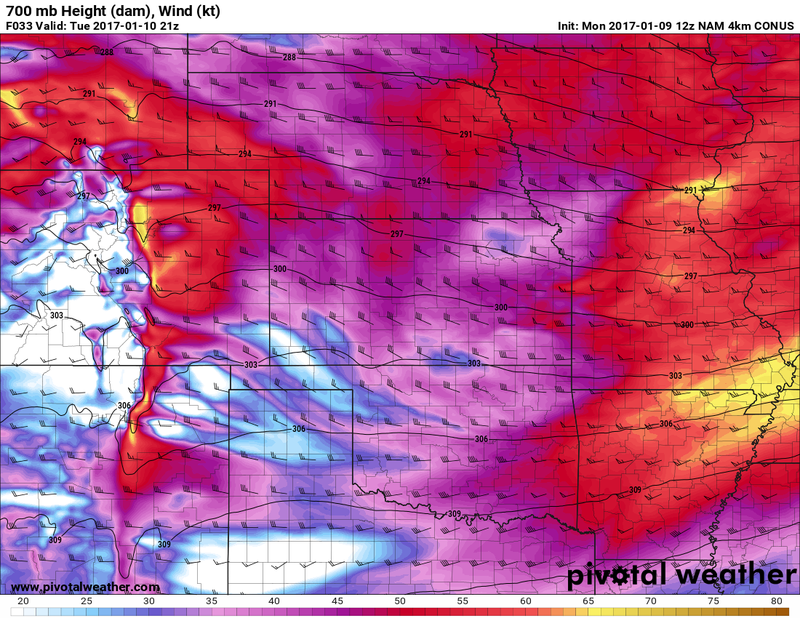 Airflow naturally wants to move from a high pressure area to a low pressure area so we see strong winds establish over the mountains and along the front range. A low pressure system at the surface (often called a lee-side low) can help enhance this effect. As the air moves over the mountains it begins to race down the front range and foothills, picking up speed as it does so. Any cities caught under the strong winds will see the situation we are having today. In addition, as the air travels down in elevation it warms, another reason we are seeing unseasonably warm temperatures in the area today. 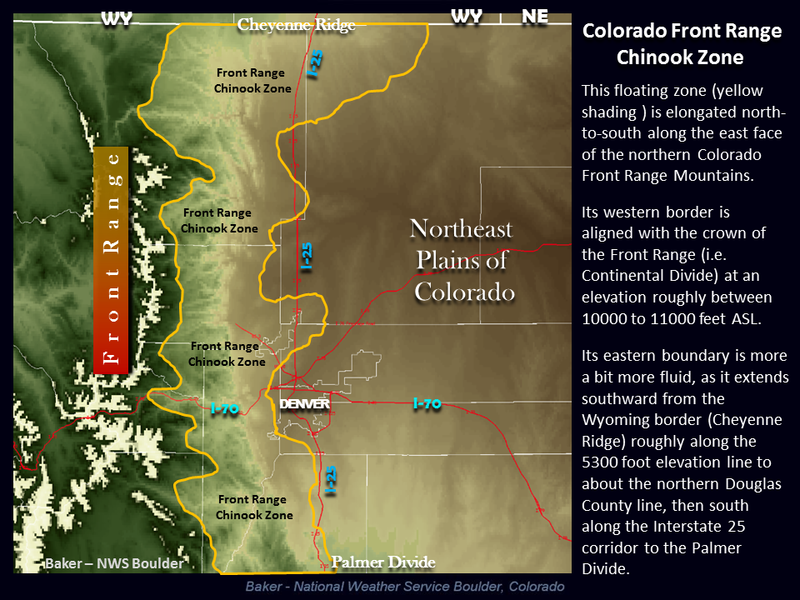 You’ll notice the areas that see the worst out of these events are what is known as the Front Range Chinook Zone. 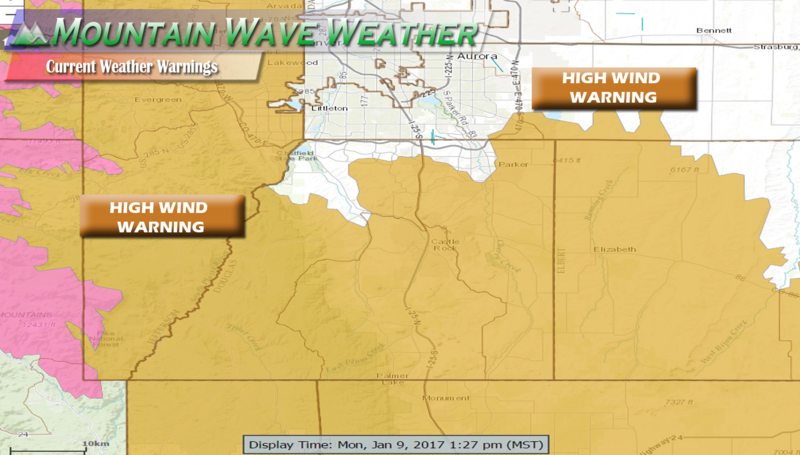 These areas are more prone to strong winds during these events due to their terrain and their close proximity to the foothills and mountains. Luckily in this case the winds look to subside a bit this evening. 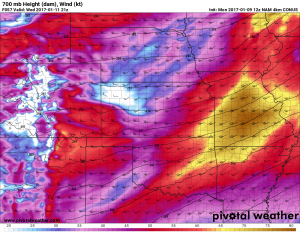 The bad news is that if modeling trends hold correct we can expect to see windy days on Tuesday and Wednesday as well, but it doesn’t look to be as strong as on Monday. 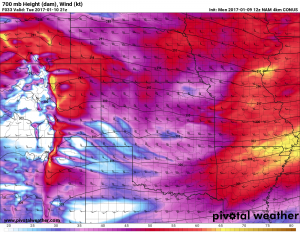 The next is a snapshot of expected low-mid level surface winds for Tuesday around 2pm. Notice the winds are a bit lighter on Tuesday but still relatively strong. 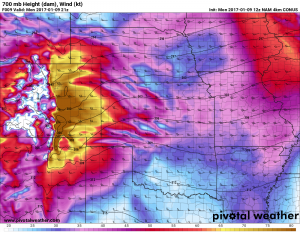 I’d expect some gusts to still cause damage and give trucks problems traveling along interstate 25. By Wednesday we see a further lightening of the winds, but still expect some gusts here and there. 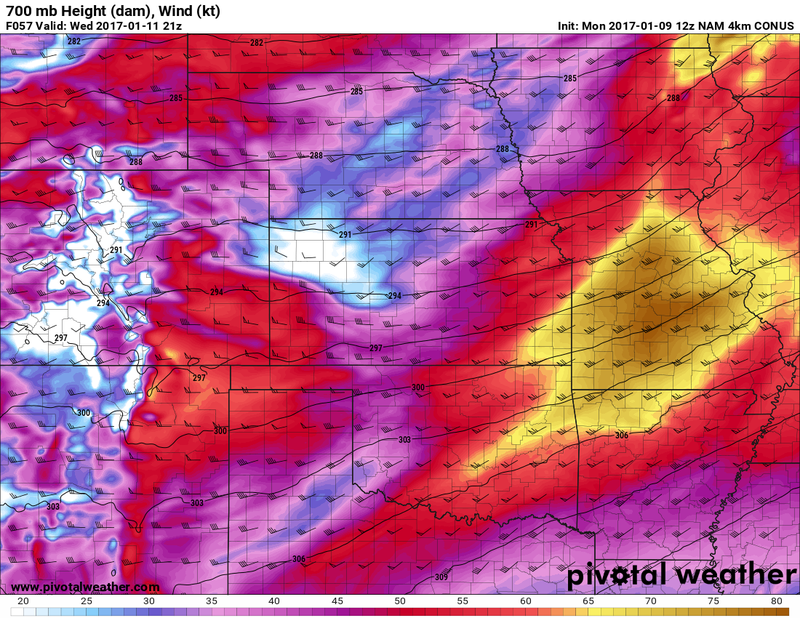 The main point here is expect strong damaging winds on Monday through the 5-6pm hour. After that we expect lighter breezes over night but Tuesday will see a return to windy conditions as the Mountain Wave re-develops over the front range. If you haven’t secured anything (or it’s blown away today) be prepared for similar conditions on Tuesday! Also, check those fences, I’ve noticed a lot of damage to residential fences around town today!